I’ve just read about this initiative and think it really helps humans AND (unwanted) dogs. Would be great if something similar could be arranged in the UK. FSD was founded in 1987 as a nonprofit 501(c)3 organization by Mike and P.J. Roche. Both Mike and P.J. 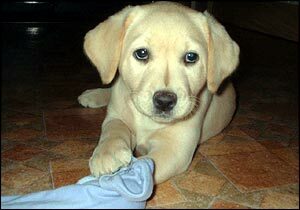 were active with Assistance Dogs International (ADI) when the assistance dog industry was in its infancy. The Roche’s worked diligently to transform FSD from a two person “mom and pop shop” to an organization that stands on its own merits. Since its inception, FSD has successfully paired more than 100 client-service dog teams in Colorado. Rescues dogs – FSD rescues and trains only unwanted and abandoned dogs, helping solve the pet overpopulation problem. There is no puppy-raising program. We turn “throw-aways” into superstars! Custom trains – FSD matches dogs to their new partner and custom trains the dog to do the specific tasks required by each individual. Provides hands-on support – FSD visits our clients in their homes, offices, and schools to introduce the service dog and to help maintain a successful team. Maximizes your donation – FSD ensures 85¢ of every dollar spent goes directly toward program expenses. Five of 16 professional service dogs graduating in 2008. Congratulations! Well, I have recently been studying about my K9 origins. Humans claim they descend from monkeys, which doesn’t surprise me, as they still show many similarities with this amazing species. Dogs today come in all shapes and sizes, but scientists believe they evolved from just a handful of wolves tamed by humans living in or near China less than 15,000 years ago. Three research teams have attempted to solve some long-standing puzzles in the evolution and social history of dogs. Their findings, reported in the journal Science, point to the existence of probably three founding females – the so-called “Eves” of the dog world. They conclude that intensive breeding by humans over the last 500 years – not different genetic origins – is responsible for the dramatic differences in appearance among modern dogs. One team studied Old World dogs to try to pin down their origins, previously thought to be in the Middle East. 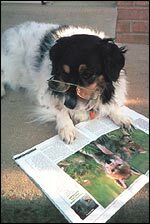 The other team studied dogs of the New World and found they are not New World dogs at all, but also have their origins in East Asia. Carles Vila, of Uppsala University, Sweden, one of the team studying the New World dogs, told BBC News Online: “We found that dogs originating in the Old World arrived to the New World with immigrating humans. He added that exactly how or why humans domesticated dogs was not known, but the speed at which they seem to have multiplied and diversified indicates they played an important role in human life. “I can imagine that if dogs were, for example, improving the quality of hunting, that would be a very great advantage for humans. It could even have made the colonisation of the New World easier. Peter Savolainen, of the Royal Institute of Technology, Stockholm, led the study of Old World dogs, analysing DNA samples taken from dogs in Asia, Europe, Africa and arctic America. His team found that, though most dogs shared a common gene pool, genetic diversity was highest in East Asia, suggesting that dogs have been domesticated there the longest. “Most earlier guesses have focused on the Middle East as the place of origin for dogs, based on the few known facts – a small amount of archaeological evidence from the region, and the fact that several other animals were domesticated there,” he says. The researchers studied gene sequences from the dogs’ mitochondrial DNA, which is inherited directly from the mother. The findings indicated that the major present-day dog populations at some point had a common origin from a single gene pool. Matthew Binns, head of genetics at the Animal Health Trust in Newmarket, UK, said the findings were significant. He told BBC News Online: “For the first time, there’s relatively convincing evidence actually pinpointing the date at which the dog was domesticated and also the location of that domestication, which is a bit of a surprise. In a separate study, researchers at Harvard University and the Wolf Hollow Wolf Sanctuary, both US, studied social cognition in dogs and were surprised by the findings. 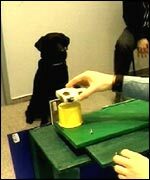 In a simple experiment designed to compare their behaviour to those of wolves and our closest relative, the chimpanzee, the findings clearly showed that dogs – even young puppies – were far better at interpreting social cues from humans. The dogs had to choose which bucket had food hidden underneath it, and the experiment was designed so they could not rely on their superb sense of smell. The scientists helped by pointing or looking in the direction of the hidden food. 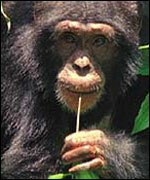 Researcher Brian Hare said the dogs outperformed even the chimpanzees, and the puppies were as good as the older dogs, proving the skill was innate and not learned.